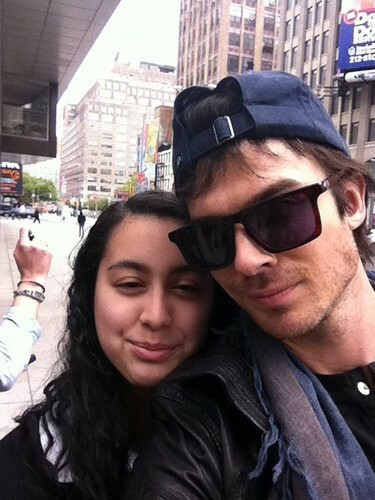 Ian & Nina leaving the Trump Soho Hotel in New York (May 8, 2012). Ian & Nina leaving the Trump Soho Hotel in New York (May 8, 2012). Wallpaper and background images in the Ian Somerhalder e Nina Dobrev club tagged: ian somerhalder nina dobrev 2012. This Ian Somerhalder e Nina Dobrev photo contains occhiali da sole, occhiali scuri, ombre, sfumature, strada, città scena, ambiente urbano, scena della via, città, and urbano impostazione.